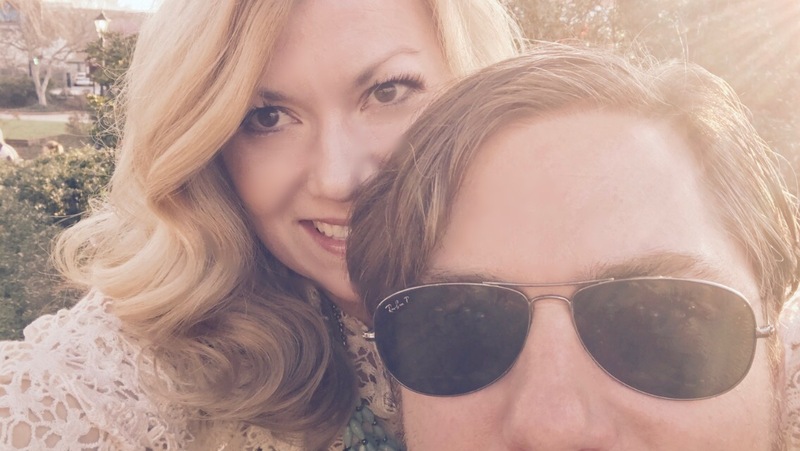 If you've been following me through my posts or on Facebook the last few weeks, you'll remember that my husband I recently took a road trip to Nashville, TN. And...I have found my new home! It was my first time there and I immediately fell in love. Even my Midwestern-born and raised husband said, "I could get use to this." After a 7 1/2 hour car ride down I-65 (ugh-I really don't like that stretch of road through Indiana), we were famished. So, we headed straight to the The Southern for a few good eats and beverages. The fried shrimp BLT and the oysters did not disappoint. Then, we walked across the Cumberland Pedestrian Bridge and back which was quite the accomplishment for someone who is deathly-- and I mean deathly, afraid of heights🙋🏼. Next up was a walk down 2nd Ave. There was a painted brick wall to my left that said-- go get a Goo Goo. I looked to my husband and asked, "What's a Goo Goo?". He then preceded to tell me about the political "Goo-Goos" or government guys in Chicago. I politely listened (as I usually do) and then turned the corner to investigate The Nashville Goo Goo. 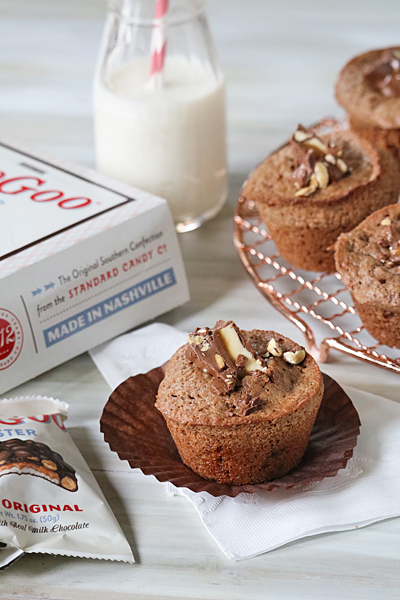 Goo Goos are historical Nashville confections. They consist of a marshmallow nougat candy, topped with caramel, salted peanuts and chocolate. Jaws are cracking. When you have all those flavors and textures in one treat, what is not more to love? Well, a recipe combining said flavors with a simple warm baked good and a generous scoop of vanilla ice cream. Can't get to Nashville for a Goo Goo? They are sold at your local Bed Bath and Beyond, as well as Cracker Barrel (I looked it up). If you are ever in Nashville for a Goo Goo or a night out on the town, head to the Grand Ole Opry. We had a great time! Position rack in the middle of the oven and preheat to 350º F. Spray a standard-size muffin pan with non-stick baking spray. In a small saucepan, combine the butter and chocolate. Melt over medium-low heat, stirring occasionally, until smooth. Remove from the heat and let cool slightly. In a small bowl, toss together the finely chopped Goo Goo Cluster and remaining 1/2 teaspoon of flour; set aside. In a medium bowl, whisk together 1 1/4 cups of flour, sugar, espresso powder, and salt. Add chocolate mixture, eggs, and vanilla. Whisk until just blended. Fold in the chopped Goo Goo Cluster mixture. Evenly spoon into the prepared muffin cups. Bake until the top of the cakes spring back when lightly touched, about 18 minutes. Remove from the oven and gently run a paring knife around the rims of the muffin cups. While the cakes are still warm, make a shallow cut in the tips of each cake and insert 1 piece of the chopped Goo Goo Clusters. Let cool for 15 minutes and serve hand held while they are warm or plate them with a generous scoop of a good vanilla ice cream. Enjoy!